Here are my blue and yellow string blocks that I sewed this past week. I still have to sew them together. I think I will add a border also. I still have lots of blue and yellow scraps leftover. There are 24 - 12 1/2" blocks sewn on a white tone-on-tone foundation. Such fun! I am making a blue and yellow one too!!! I just gotta sew my squares together. Maybe I'll post it tonight. I am going to sew today with my Sunday Sewers Group. Those are a very pretty color combination! I like the white center strips. 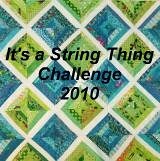 I've only made one string quilt so far. I'm putting the border on right now. But, all the while I was sewing the blocks, I was thinking what center strip colors I will use on the next string quilt. Very addictive! I love blue and yellow also and am hooked on string quilts. Gonna have to try this one! Love it!